This holiday park is situated in the mountains of the High Sauerland Untervalme, 20 km from Winterberg and 32 km from Willingen. The cozy and newly renovated rooms are right on the edge of the forest. You can choose from one of 10 houses that were built in 4 different styles. Discover this beautiful natural environment along the network of trails. In many of the rivers and lakes you can swim or fish. For winter sports there are numerous cross-country ski trails and facilities within easy reach. The complex has a place to barbecue and a playground / lawn for the children to play on. In the woods near a stream, both young and old can have lots of fun. In short, a wonderful small park in a beautiful natural environment! These apartments have an idyllic location, and each has a private entrance plus a terrace or balcony. This two-level house can accommodate up to six persons. The living area is about 50 m2. The ground floor consists of a living room with a dining area and open kitchen. In the kitchen you will find a refrigerator and four electric hotplates. There is also a coffee maker and of course all the necessary cups, glasses, cutlery and utensils. The bathroom has a shower, sink and toilet. Next to the bathroom you will find a bedroom furnished with bunk beds. A stairway from the living room leads to the top floor where there are two bedrooms (one furnished with a double bed the other with a bunk bed). From the terrace you have a wonderful view of the surroundings. Attention! Price for a weekend is from Friday to Sunday (8:00 pm) If you would like to come on a Monday, you can book it as an extra service. The Sauerland is also known as the land 'of a thousand mountains' and consists of high peaks, deep valleys, rivers, roads, meadows, forests and cozy and charming villages. The Sauerland is without a doubt one of the most beautiful and diverse regions in Germany. Hike through a diverse natural landscape with panoramic views! Henne in Meschede is a great place to swim or row in summer, or even take an excursion by boat. There are recreational activities for everyone, no matter the season. For example, visit the Fort-Fun Adventureland amusement park, with up to 40 attractions (7 minutes away), or the Lagunebath in Willingen (33 km), which is sure to be an adventure for the whole family. Other options: whirlpools and a wild water bath. The region has ideal conditions for mountain biking along a variety of mountain bike trails (180 km of marked hiking trails). Sauerland is also a paradise for bikers. It is certainly worth visiting the idyllic little towns in the area with their timbered houses. These include the spa town of Bad Arolsen and Kassel with its art & culture. Near Valmetal you will find a number of winter sports destinations, such as the ski resort of Bödefeld-Hunau. This resort is located on the northern slope of the Hunau. Winterberg and Willingen are the most popular ski areas with the Germans. Here you will find all levels of difficulty, from beginner to professional. 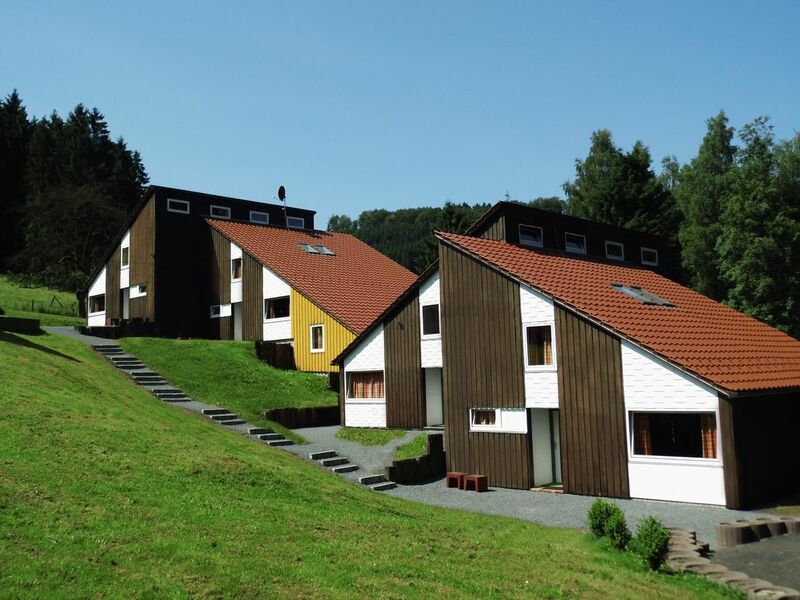 There are 15 minutes from the cottages to the ski area of Winterberg. Skiing and sledding (Sauerland SnowPhone): 01805/483333. More information at: www.skiliftkarussell.de, www.wintersportarena.de, www.hunaulift.de 7 minutes, www.fortfun-winterwelt.de 5 minutes, www.erlebnisberg-sternrodt.de 15 minutes. Bookings in winter season (01.10 t/m 31.03) for arrival within 3 days are on request. The weekend for 2 nights applies to Sunday 20:00 PM. The houses are set idyllically at the forest and on the course of a stream. All houses have a private entrance and patio, balcony or courtyard with a lawn. Children's playground, soccer field, barbecue, lawns available. Garden furniture and barbecue are available in every house. Travel cot and high chair available. Satellite - TV, safe available. The kitchenettes are equipped with sink, water heater, refrigerator, 4 electric hot plates, upper and lower cabinets, coffee maker, pots, dishes, cutlery and glasses. The houses have electric heaters. All beds have a spring mattress with a size of 200 x 90 cm. Pillow Size 80 x 80 cm and bed quilt size 200 x 135 cm. Please bring with yourself linens and kitchen towels. For a fee of € 10, - per person- bed linen (pillow, duvet cover and mattress cover), available. Washer and dryer are available for a fee. The final cleaning is included in the prices. You only have to leave the house broom-clean. Dogs are allowed on request- 8,- € per night per dog. Did your holiday home match the description on the website? Was your holiday home clean upon arrival? In consideration of the price, was your holiday home of good quality and complete upon arrival? Were the facilities of the holiday home and surroundings as expected? This period cannot be booked online because the startdate is too close to the booking date.